I’ve often been asked, “What is the biggest mistake you’ve made in your business?” And the first one that comes to mind was not creating and selling products much sooner. I was in business for years and years before I created my first product. Up to that point I only offered consulting and workshops. And why didn’t I create and sell products sooner? Simple. I was afraid of doing it wrong. I didn’t want to risk making a mistake. I finally took the leap in 1996 and taped a live workshop and sold the tape set. And when I look back at how well I’ve done with information products, it seems the risk was mostly in my own mind. Nothing went wrong. People loved the tape sets and I made great money. And then this first product became the foundation for more products to follow. Now more than 50% my income comes from products. I’m not saying that it’s dumb to avoid all kinds of risk. Some risks are truly RISKY. You could lose everything. These kinds of risks need to be considered very seriously. Risking to learn something new. You really wouldn’t think it was risky to learn something new, but you’d be wrong. You see, anything that is outside of our comfort zone is perceived as risky. Even if the upside is huge, it’s easier to stick with the status quo. I’ve recommend books to people and you think I’d asked them to jump off a cliff! Are there some things that you could really benefit from learning but you’ve put them off because they will take you out of your comfort zone? Take a sec and write them down and we’ll come back to them later. Risking to try something new. And if learning something new is perceived as risky, then actually doing something new is… well… better thought about later! We’ll think about doing that marketing plan, that web site, that eZine, that presentation later on when conditions are better. But like me, finally creating information products to sell, the risk was entirely imaginary. In fact, I was taking a much bigger risk with my business by not creating information products sooner. I was earning less income, missing opportunities, stagnating. Ultimately we’ll only take a risk when we realize that the cost of not acting is greater than the cost of acting. Unfortunately, we often have these realizations a little too late. What are those things you’re putting off? Again, take a second to write a few of them down. Now you have a short list of things you’re not learning but could probably benefit from learning and another list of things you’re not doing but would likely profit from if you got around to doing them. Is this something that would truly benefit me if I learned it or put it into action? What are some of the possible benefits I might gain if I learned or did this thing? What could I potentially lose if I didn’t learn this thing or do this thing? What’s the worst that could happen if I took a risk and learned this thing or did this thing? When you ask these four questions of every item on your list, you’ll have reframed your risk. What used to look risky might not look so risky anymore. In fact, it might actually start looking like a great idea to learn or do this thing. 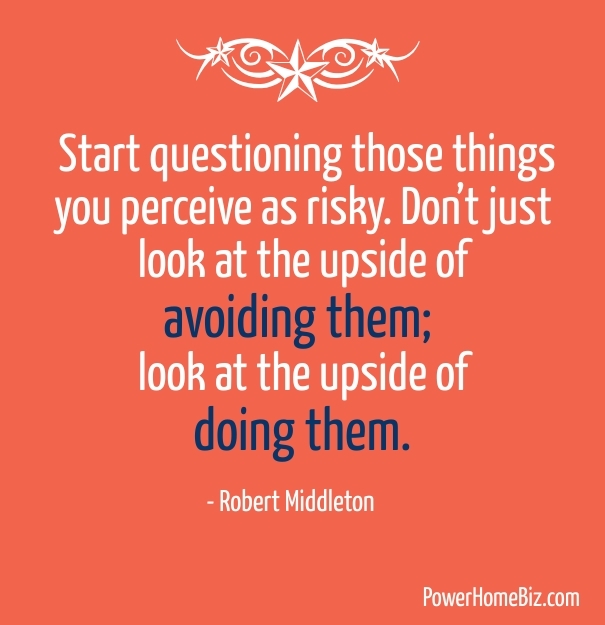 The More Clients Bottom Line: Start questioning those things you perceive as risky. Don’t just look at the upside of avoiding them; look at the upside of doing them.